In the second part of Dwight Thomas’ history of Sikalongo Mission in Zambia (the first part was in the December 2016 edition), Dwight picks up the story following the death of Myron Taylor in 1931 and describes the development of the mission, particularly the expansion of educational and medical endeavors, from 1931 to 1947. He highlights both the North American missionaries and the African leaders who led the mission during these years. While this history focuses on one mission station, and a relatively small one at that, it is an important window into the broader story of missions in general, and Brethren in Christ missions in particular. In Part 2 of the story of Sikalongo Mission, the white missionaries are still in charge, but African leaders are being mentored, trained, and encouraged, pointing toward indigenization and the time when the leadership of the Brethren in Christ Church in Zambia would be transferred to Zambians. The third and fourth parts of the history, to be published in subsequent editions of the journal, will tell the story of how that significant transition happened within the context of national independence, and how Sikalongo Mission continues to thrive today. 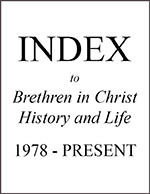 The photographs (some admittedly not particularly high quality) that accompany the article are a testament to the importance of individuals and families passing on well-labeled photographs to the Brethren in Christ Historical Library and Archives. The second major feature of this edition is a memoir. In 2015, at the time of the death of Harriet Bohen Bert, my mother’s last remaining sibling, I learned that my aunt (and namesake) had written her memoirs. Naturally I was curious, so I borrowed a copy from one of her sons. Harriet’s story was most interesting to me because of the family connections, but I also thought that her story was one worth sharing with a wider audience. Even though she was fairly well-known in some circles and her husband served on denominational boards, Harriet represents many Brethren in Christ people who never expected to achieve prominence, but quietly served God in their homes and churches. Many of them were women who, as Harriet claimed for herself, were “called to be homemakers.” Harriet probably never intended for her memoirs to be read by anyone other than her immediate family, and I am grateful that her family recognizes the significance of her story and is willing to share it with a wider audience. I especially want to thank Karin Bisbee, Historical Society board member, for her significant preliminary work editing the original manuscript. In the third section, we feature the presentations from the November 2016 study conference sponsored by the Sider Institute for Anabaptist, Pietist, and Wesleyan Studies at Messiah College especially for Brethren in Christ pastors and laypeople. The conference was on the theme of “Not Conformed: The Church, the World, and Christian Discipleship in the 21st Century.” The keynote speaker was Dr. Mark Labberton, president of Fuller Theological Seminary, with three other major presentations by Dr. David Weaver-Zercher, professor of American religious history at Messiah College; Dr. Gerald Mast, professor of communication at Bluffton University; and Dr. Drew Hart, assistant professor of theology at Messiah College. Their presentations are all reprinted in this edition. Finally, four reviews and a letter. The reviews cover two books about politics in the Bible; one about the history of Mennonites in Ontario, Canada; and one about tourism among the Amish. The letter to the editor is in response to the article about Janice Holt Giles in the December 2016 edition..